This is the third in the five-part series, 'Getting Healthy in 2016,' in which SI.com's in-house sports scientist Michael J. Joyner will be talking with team doctors, trainers and experts from the world of sports to help our readers learn how they can improve their lives by eating, training and living better. This is the third piece in the five-part series, 'Get Healthy in 2016,' in which SI.com's in-house sports scientist Michael J. Joyner will be talking with team doctors, trainers and experts from the world of sports to help our readers learn how they can improve their lives by eating, training and living better. For parts 1 & 2, visit si.com/edge. Going to the gym regularly or following a structured workout program is not for everyone and there is all sorts of new research showing that sitting all day counteracts some of the positive effects of exercising and is just plain bad for you. Most of us also don’t have the time or motivation to exercise enough to eat whatever we want. One way around this problem is to focus on a less structured way to be active like simply getting outside, joining a local recreation league and utilizing active forms of transportation wherever you may be going in your day. One person who has thought a lot about this is Dr. Jill Barnes from the University of Wisconsin-Madison. Dr. Barnes also has a big interest in how exercise and physical activity can keep the brain sharp throughout a person's life. So without further ado, let's get into how you can stay in shape outside of the gym. Jill what are your top three tips for generating a more active life outside of a traditional gym setup? Dr. Jill Barnes: Do something first thing in the morning. This activity can be as simple as playing with your child, walking the dog, doing a few pushups or yoga poses. If the day gets away from you, at least you have spent a few minutes being active. Second, rethink the time you spend commuting and running errands. Active transportation (any self-propelled mode of human transportation) is a great way to incorporate more movement into your daily routine. Third, we spend a lot of time in “transition” waiting for something to happen (usually on our smartphones). Can you stand while waiting for an appointment or meeting? Can you walk around the airport while waiting for a flight? Can you carry the heavy items while in line at the store? Stand up, pace, walk, focus on your posture, anything to remind us that we are human and are meant to move! Once a day, if you choose to do something differently the extra activity will add up. MJ: You live in Madison, Wis. and your family has one car, tell us more about active transportation and the logistics of building activity into your life. JB: We went down to one car over 10 years ago as an environmental decision, and this has forced us to think differently. It is fun to invent ways to incorporate active transportation in day-to-day life and avoid the car. Biking or walking is more enjoyable and often more time efficient than traveling by car. In terms of logistics, choosing to live near bus/train lines and bike paths is important, but is not a requirement for active transportation. Madison has an amazing biking community and bike commuters are quite creative at overcoming logistics like dropping children off at school or carrying large items. 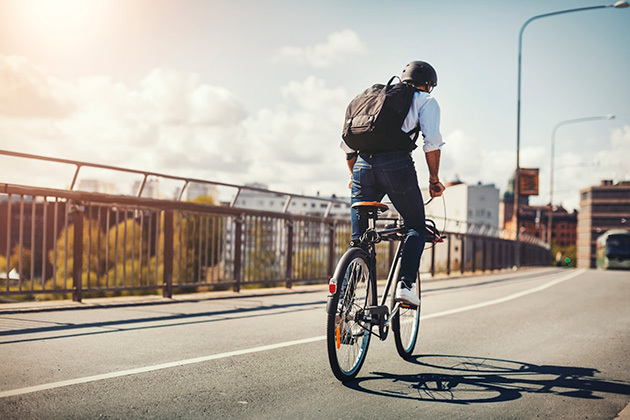 Active transportation burns a few calories, requires concentration to navigate, eliminates that morning brain fog, builds a sense of community due to frequent interactions with neighbors, and improves mood. What about accountability and things like trackers and apps. Are you an active user, believer, skeptic or neutral? JB: These devices are great for motivating behavioral changes and tracking progress. I like numbers so these tracker and apps are very interesting, but I have not found a device that I use frequently. The hardest workouts are often are not reflected in the fitness tracker numbers. Being too reliant on the tracker may limit the freedom of doing a variety of activities at multiple times throughout the day. However, I am hopeful that as these devices improve, they will be very useful for accurately quantifying daily physical activity over a large range of movements. MJ: Why do so many people use a Stairmaster but avoid taking the stairs? JB: No one wants to arrive out of breath and sweating; and in day-to-day life, we are not always wearing comfortable attire or shoes and dressed to sweat. Taking the stairs always uncovers our weaknesses and reveals our level of fitness. However, the stairs can be used to track progress. How many flights of stairs can you climb while maintaining a conversation? Can you incorporate a few more flights of stairs each day? As for attire, if you are not comfortable, sneaking in extra physical activity throughout the day will be more challenging. How much can something as simple as walking the dog do for your health? JB: Similar to active transportation, walking the dog has a lot of benefits beyond burning a few extra calories. Even if it may seem minor, the social interaction, concentration needed to navigate, planning around the weather, bonding with the dog, all benefit the mind and body. There is a reason that people who walk their dog are healthier and happier. MJ: Exercise and physical activity are good for the brain. Is physical activity that requires active brain engagement even better for the brain? JB: Observational research studies have shown that adults who regularly exercise have better cognitive test scores. One study in particular found that older women who walked the most blocks per week or expended the most calories per day had higher cognitive test scores. This suggests that the cumulative activity as part of a daily routine is important, even if it's independent of a formal workout. Perhaps the concentration required while bike commuting or walking the dog is benefiting both our waistlines and our brain! MJ: Are there other ways to incorporate more physical activity without working out? JB: I think we underestimate the usefulness of backyard games and pick-up sports. Often at parties and gatherings, it is only the children playing. Why can’t we as adults have more unstructured play? Michael Joyner, is an expert in human performance at the Mayo Clinic, these views are his own. You can follow him on twitter @DrMJoyner.